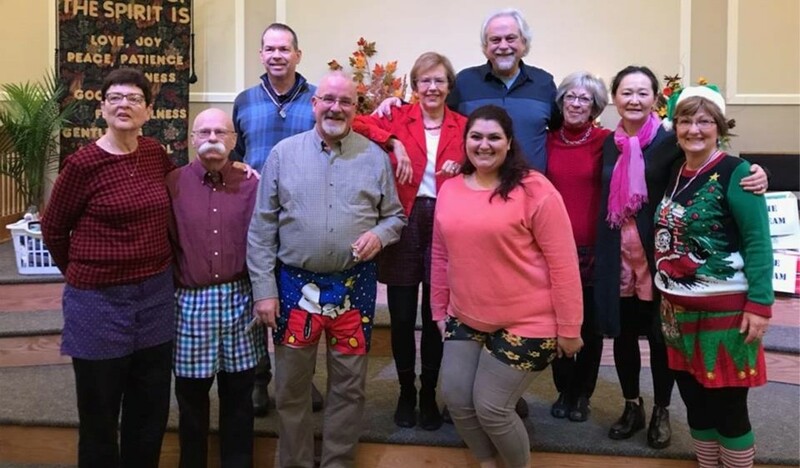 Some of the brave members of the Church of the Cross wear their wackiest boxers to worship during “Undie Sunday” in late November. A donation of undergarments went to a local shelter in Erie, PA. 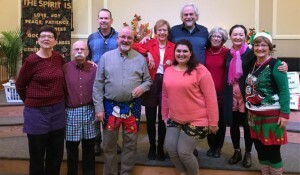 The Church of the Cross capped off a month-long underwear collecting initiative in late November with an awards ceremony that also celebrated “Team 1” beating out the “A Team” for the greatest number of undergarments collected among the congregational split. All told, 840 pairs of underwear, undershirts and socks were donated to “Our Neighbors’ Place,” an overnight shelter in Erie that the Church of the Cross helps staff along with the First Presbyterian Church of the Covenant on a rotating basis. “It was a way to get the whole community of the church involved and raise awareness to an issue in our community none of us ever thought about,” said the Rev. Drew Himes. “We thought about food, we thought about shelter, we thought about clothing, but we didn’t think about underwear. Socks and underwear are vital needs for homeless people because when they get dirty, many times the garments just get thrown out since the needy don’t have money for the laundromat. It’s a fact that many people aren’t aware of when thinking about the needs of the homeless. Drew said his congregation first became aware of the need for undergarments last year when, while partnering with First Presbyterian Church of the Covenant at “Our Neighbors’ Place,” they learned of the severe need for such clothing. Church of the Cross Mission Committee chair Darla Speranza heard about this need and brainstormed with the committee and Drew about ways to make the collection a fun event for the congregation. 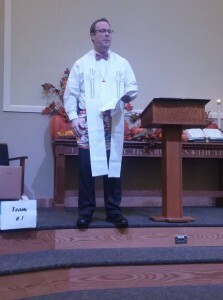 During the four Sundays in November, the congregation was urged to donate undergarments, which were collected offering-style by having large laundry baskets passed among the pews like offering plates. On “Undie Sunday,” which occurred on the last Sunday of the month, worshipers were urged to wear “wacky” boxer shorts and pajamas on the outside of their regular clothing to participate in a contest that was judged based on congregational applause. Among the top awards handed out went to the person who participated who was most likely not to participate, thus resulting in the Black Boxer Award. It all added up to a light-hearted way to create some energy for a cause that was in desperate need of attention. “I was absolutely astounded,” Drew said when asked about the generosity he has seen from his congregation. “This church has always had a very missional DNA, but over the last few years some of that – when they were in transition – got lost. My work over the last year has been to be much more hands-on, much more missional with them. The “Our Neighbors’ Place” shelter is staffed by several churches in the Erie area. Church of the Cross and First Presbyterian Church of the Covenant team up to volunteer for two-week periods, helping to serve dinner and breakfast complete with silver wear and good china place settings while also being available to talk to the “guests” at any time throughout the day or night. “The whole sentiment is treated very differently,” Drew said. “When you think of a lot of soup kitchens or shelters, they just kind of hand out whatever. At Our Neighbors’ Place, Pat Tracy, who is from Covenant, she believes that it should be treated as if we are opening our very own homes to guests. Everyone is treated as a human being, as they should. Everybody’s called by name. It’s a perfect mission for a congregation that doesn’t mind going the extra mile to make a difference in its community.